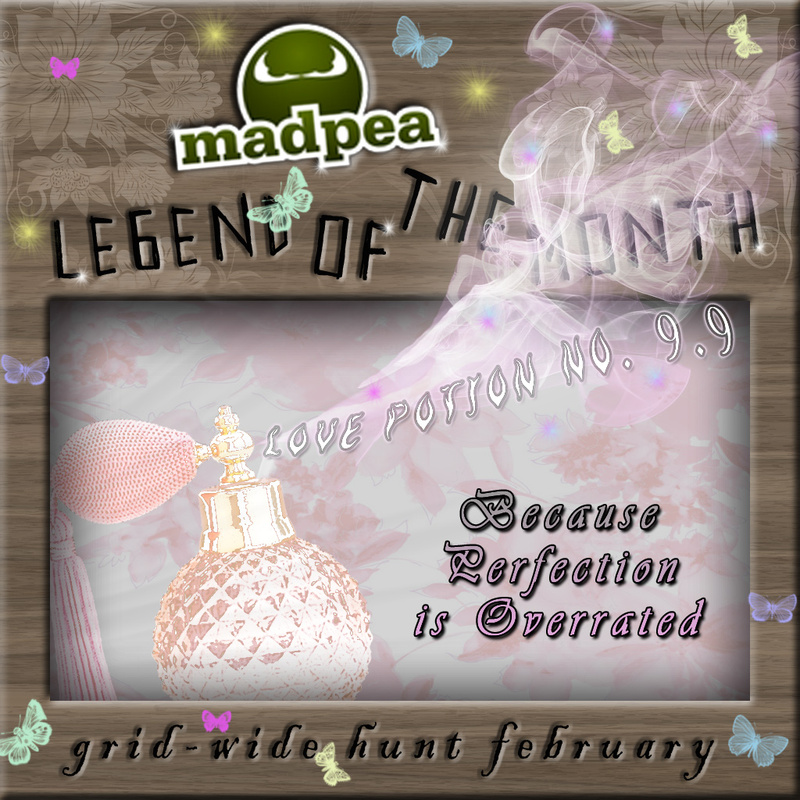 You are about to join a Grid-Wide Love Potion No. 9.9 Hunt by MadPea Productions! Story: Legend of the Month is a series of hunts, where each month a new legend is discovered and the stories take you on interactive grid-wide adventures. In February, of course, we had to make the hunt about Love. 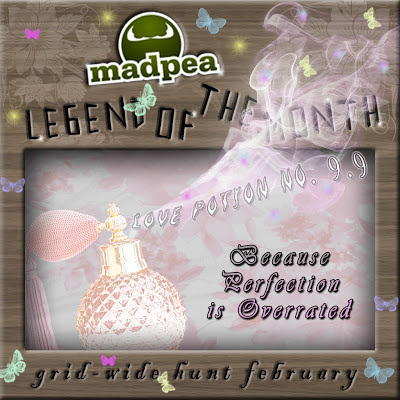 However Love Madpea style is, as always, a bit unexpected. The hero of our story, Phinneas Phicklephogg, is an alchemist. He is not a very successful alchemist but it is not because he is not well versed in the magical arts. It's just presently there doesn't seem to be much need for his magical abilities until he receives a letter in the mail that is. A letter requesting his assistance in decoding a recipe for Love Potion No. 9.9. 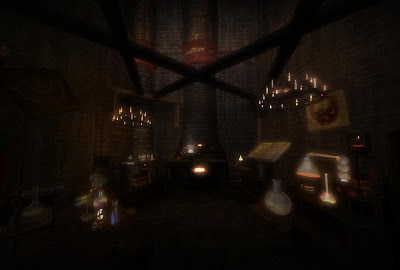 The letter isn't signed but it is delivered with a bag of gold as a down payment and a promise that if Phinneas can decipher the recipe and create the potion, he will be richly rewarded for his efforts. 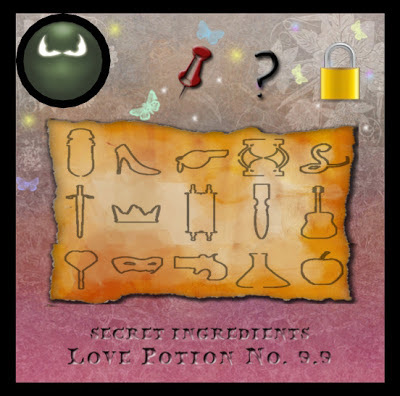 The recipe states that 15 ingredients must be collected and combined for the potion to work but all that is given in the way of ingredients is a list of books followed by the instruction "Harvest the Essence of Their Love". Phinneas must decode what this vague instruction means, find the ingredients, mix the potion and deliver the final creation to the mysterious author of the note. Is this even possible? 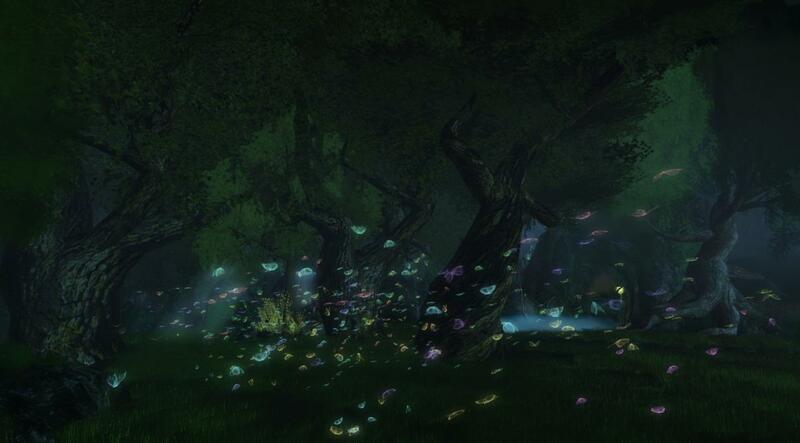 Will you join us in making this quest the best Love inspired event on the grid? 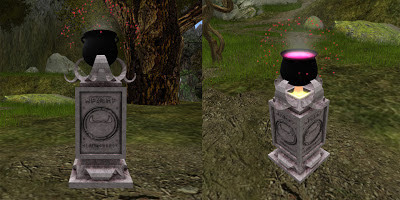 ••How to: Purchase the HUD from the cauldron for 50L and wear it. It will set in its correct position on your screen. Before you can begin with the hunt, you must find a recipe for the ingredients that you need to look for. Check out the library for an important letter and start your introduction to the game. Please understand that this game is a point-and-click treasure hunt. Clicking items will give you clues to advance in the game. Your ultimate goal is to find 15 items in grid-wide locations, eventually taking you to the final game play area where you will be rewarded with 15 high quality prizes. 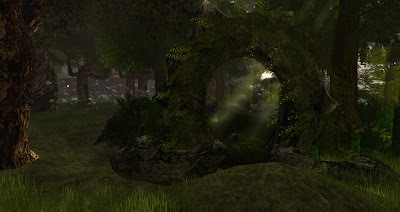 Once you click a silhouette of an ITEM on the HUD, it will give you a hint and a SLURL in local chat to a location where an the item has been hidden. Once you find an item the silhouettes on the HUD will turn into letters that will form words. Please note, the hunt items do not give out prizes. You must collect all of them to receive the prizes at once in the end. When you have found all the hunt items and have the magical sentence revealed on your HUD, follow the instructions given in the chat to you. - To HIDE the HUD, simply click the MadPea on top left corner to rotate it. - You must wear the hud to be able to get clues and prizes. - Allow the Windlight settings when entering the sim. It will set the atmosphere for you. - Reduce draw distance to minimum and turn up the sounds. - Please remove facelights and heavily scripted objects. - Allow the regions you enter enough time to rez, so that you can see everything clearly and not bump into random people and objects. When: The hunt will run from February 1st till March 14th. 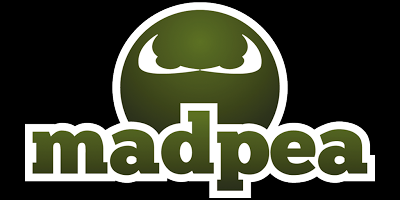 Extra help: To discuss about the hunt or ask for help, you can join the MadPeas group and talk in group chat. We will also post clues and happenings on our facebook page. The following rules and instructions must be followed to ensure that everyone gets to have a nice hunting experience. •NO GRIEFING - the locations that you will be visiting are participating only in allowing the use of the area. The environments do not belong to MadPea Productions. Do not grief their other customers, visitors, members or residents. Do not break their posted rules. 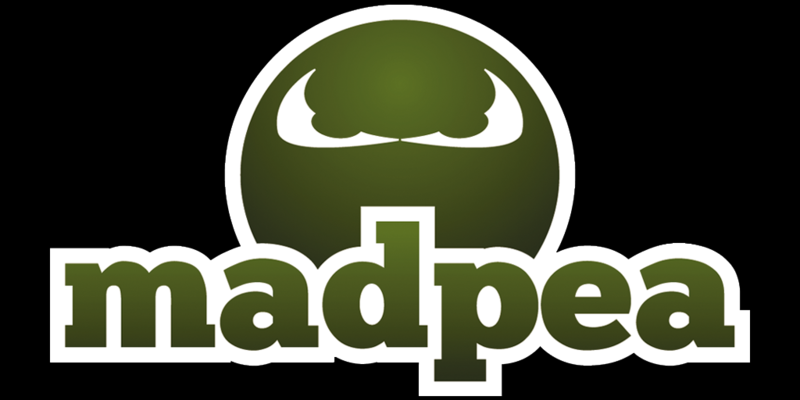 •GROUP TAG RECOMMENDED - When you are hunting, we would really appreciate if you wear the MadPea Group Tag. •NO LITTERING - Unless otherwise instructed to do so, do not rez or lay any objects from your inventory on any of the locations you will visit in the game. •MALFUNCTIONS - We are aware it is Second Life which has its own issues that we can not control, such as location logouts, reboots, or lagging and crashing. We have conducted several pre-game walkthroughs to make sure the hunt runs smoothly where it should, but we make no complete guarantees that there will be no issues during the hunt. Should anything happen beyond our control that disrupts or halts the hunt, we will announce it in group notices at the first possible opportunity, providing further instructions relevant to the issue. •REFRAIN FROM BAD SPORTSMANSHIP - Do not harass other players, do not instigate conflicts, and if you get stuck, no whining and complaining in group chat. When you enter a new region, give it some time to rez before bumping into everyone else. •GROUP DIALOGUE IS ALLOWED - You are allowed to communicate in group chat and help each other out. You are however NOT allowed to give out an exact location of the hunt item. This adventure is full of love, magic and fantasy. Unlike the usual MadPea Hunts, you will not die here. Let yourself fall into the madness and maybe even fall in love. Thanks for such a great hunt! I had fun and finished with the help of a few really nice people. I also did some terrific shopping and got nice things, but I really love the love potion gifts! I'm so happy. The hunts are really fun!